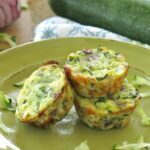 Zucchini Egg Muffins are low-carb, gluten-free and super easy to make. They'll become your new favorite snack or breakfast. Using a grater with large holes, grate zucchini into shreds. Spread zucchini shreds out on a clean dish towel. Close towel and turn to squeeze out excess moisture. Measure 2 cups of zucchini shreds for this recipe and reserve any leftover shreds for another use. Scoop mixture into mini muffin tins coated to prevent sticking. Press the mixture down with the back of a spoon to tightly compact in each muffin tin well. The yield will be about 18 mini muffins or 6 regular sized muffins. Add 5 minutes to the cook time for regular-sized muffin tins.